It’s bitter sweet for producer Danielle Tarento as she brings the late Michel Legrand’s five-time Tony-nominated musical Amour – a musical fantasy about daring to dream and the power of self belief – to the Charing Cross Theatre from 2 May to 20 July 2019. She hopes the production will be ‘a fitting tribute to this extraordinary man’. 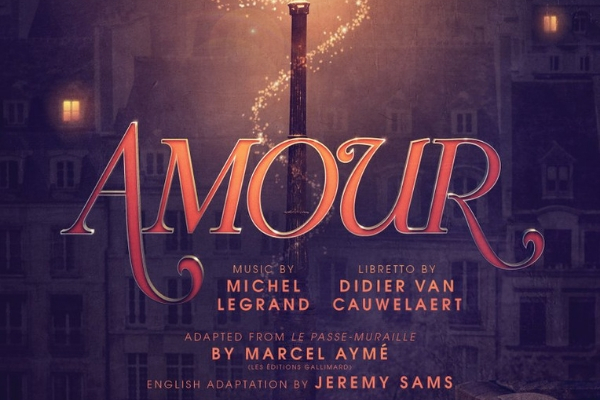 Amour has music by Legrand with English lyrics by Jeremy Sams (from the original French by Didier Van Cauwelaert). Adapted from the 1943 short story Le Passe-Muraille by Marcel Aymé, Amour opened on Broadway in 2002 and was nominated for five Tony Awards, including Best Musical. Leading the creative team at Charing Cross Theate is director Hannah Chissick. Michel Legrand, who sadly passed away, aged 86, on 26 January 2019, was predominantly a jazz musician and film composer with 200 film and television scores to his credit. In a prolific career he won three Oscars and five Grammys. He made his Broadway debut with Amour. “Whilst I am so delighted to be producing this beautiful show, there is a tinge of sadness that Michel never got to see Amour in London, something that he sorely wanted. I hope the production serves as a fitting tribute to this extraordinary man’.